Tree trimming is an important aspect of yard and arbor care. We trim our tree branches to have beautiful, healthy looking trees, and promote new growth. Additionally, most of us find ourselves having to trim trees for safety reasons, when unruly branches pose a hazard, or an impending wind, thunder, snow, or ice storm gives us an extra pause. 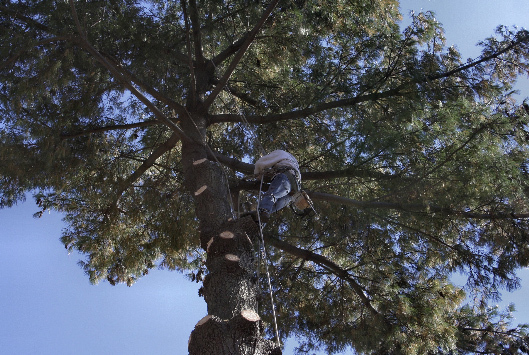 Tree trimming for safety reasons prevents damage to our property, damage to our home, and potentially, injury. You may need to thin out your tree, to reduce falling debris, and facilitate a healthy looking tree. Perhaps you need to completely cut off low-lying branches that are impeding movement around the yard (of both people and machinery). Or maybe you need to reduce the crown of the tree, which may start to get overgrown, and cause trouble with power lines, or prevent desires rays of sun to the house. Are dead branches your problem? These stubborn dead ends may need to be manually cut down before they come crashing down with even the slightest wind - posing danger to both your property and your family. No matter what your tree trimming need is, allow us to help. We can handle any tree trimming task, large or small. Our specialized training and equipment allow us to take care of even the most difficult tree trimming jobs. We'll respect the integrity of the tree, respect your home, respect your time, and your money. We'll do the job right the first time, every time. And we'll leave little trace of our presence, picking up and hauling any debris with us, and covering any tracks or marks made in the process of the job. Don't risk your safety and waste your time. When you need a landscaping job like tree trimming, count on the professionals to help.